My customer had been gifted a ring that belonged to her late Grandmother. Very much a 70-80`s look and she wanted something lower and more contemporary. She really liked this design she had seen on the internet. As soon as I saw the design I knew that as so often happens what we start with is very different to what we end up making. 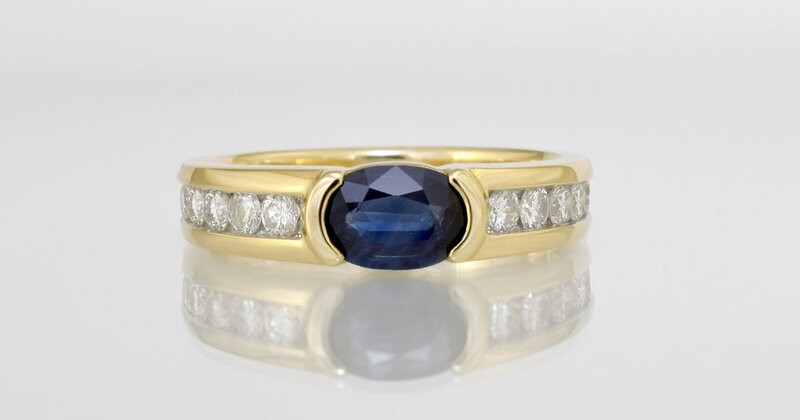 We would take that design, make the setting of the main gem lower and then channel set the diamonds into the band. She wanted something like this. I set about digitally creating the design and you can see from the photos below the design is similar but at the same time totally different. She loved it. Rings can look very different in isolation in a photo. To give her an idea of how the ring would look on her hand in the third photo you can see I edited the proposed design into a photo of her hand to scale. Scaled onto the customers hand with some colour. 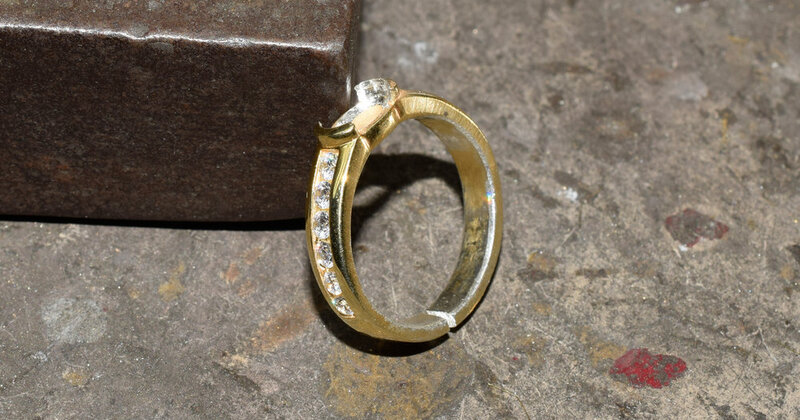 To double check that what we had designed transitioned to exactly what she wanted in real life I made a draft from sterling silver, set some cubic zirconia into it and then gold plated it. You can also see from the base of the ring that we used the draft to modify it to the prefect ring size for that design on her hand. This sapphire has some heavy banding in it. 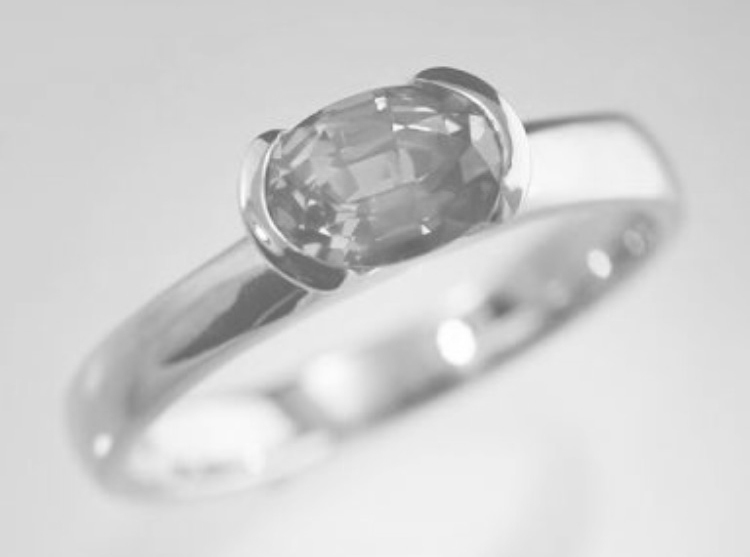 Appears almost like a cloud in the gem and is more visible when the gem is set across the finger. 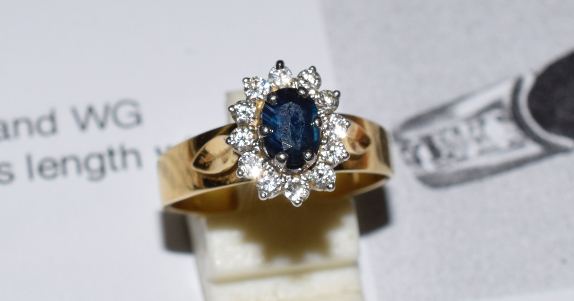 I pointed this out to customer at the very first meeting but she preferred the gem to be across the finger and the flaw let her know that was Grandmother`s Sapphire. 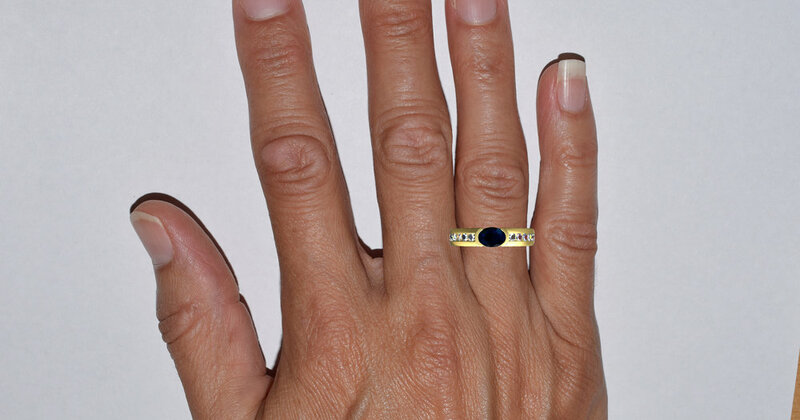 The oval cut Sapphire is 6.8 x 4.8mm. The side diamonds in the band come to a total diamond weight of .48 carats. The ring was made in 18ct yellow gold.